DAC para athletes Kayden Roe, Matthew Whitehead and William Baxter each struck double gold in a glittering season finale at the CP Sport National Championships in Doncaster on 1 September. The fine weather and home turf suited the trio as DAC hosted the final event in the CP Sport national athletic series. 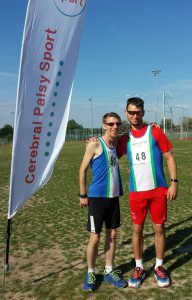 The championships attracted almost 40 athletes with cerebral palsy from across the UK, Ireland and Holland in a busy track and field programme. Kayden secured a sprint double in the T37 men’s 100m and 200m. Matthew won gold in the T20 men’s 200m and 400m. William won the F36 men’s shot put and set a new national record of 36.58m in discus to win gold.